Our skincare products are designed to boost and maintain a healthy synergy with the skin. We know that the right products and ingredients can elevate your skin to new heights, improving tone and texture, and treating sun damage, acne and ageing. We stock a full range of cosmeceutical clinic-only skincare products. These professional ranges contain active ingredients at high doses, making them very effective in treating and managing a range of skin concerns and conditions. An appropriate skincare regime can help keep your skin in top condition, greatly optimising the outcomes of your in-clinic treatments. Your skin health will improve and you will be able to maintain a radiant glow when using the right products at home. It is common for us to see many skins that are suffering due to incorrect skin care. For example, it is essential that acne-prone skins follow a recommended regime in order to manage the breakout as best possible. Another common issue is not using sunscreen. Many of our patients are concerned with pigmentation and ageing, but haven't been educated properly on the importance of daily sunscreen. Each and every skin type benefits from using correct home care products. Before some treatments we may require you to 'prepare' your skin with set products. This preparation period helps to regulate the skin, remove build up of superfluous dead skin, manage breakout, or reduce pigment production. The types of products and why you should be using them varies greatly from individual to individual, and the best way for us to recommend the right products is after a consultation. During a consultation we will discuss your concerns and expectations, dietary and lifestyle factors, sensitivities, skin type and skin condition. Our VISIA complexion analysis machine can easily show you what state your skin is in. From these images we can correctly and professionally give you recommendations on what products would be good for you, and what treatments you would benefit from. 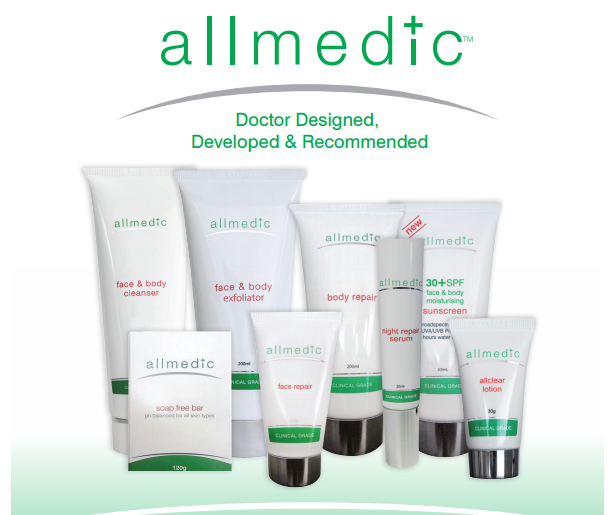 Allmedic is our preferred range for sun damaged skins. It is also very effective in the treatment and management of acne, oily skin and dry skin conditions. The active ingredients contained in Allmedic products mean it is a versatile range. We use Allmedic to prepare skin for photodynamic therapy. Allmedic is also great to use on larger areas like the arms, legs or back, when treating sun damage, skin dryness or acne. Australian made. Great for men and women. Best selling products include the Active Face & Body Cleanser and Skin Repair. O Cosmedics is another Australian range. It is a complete range offering cleansers, exfoliants, treatment serums, masks, moisturisers and sunscreens. We love to recommend O Cosmedics for all skin types from sensitive, acne, aged, sun damaged and normal. With a large focus on active ingredients (retinol, vitamin C, vitamin B, AHAs, salicylic acid, hyaluronic acid and peptides) you can achieve your skin goals and restore a radiant complexion. 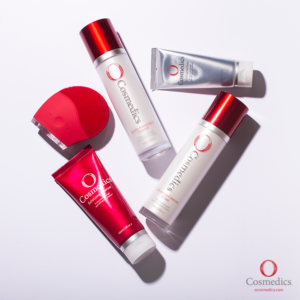 O Cosmedics is a clinic-only brand and cannot be bought online. The ingredient profile and its high activity mean it must be professionally recommended. O Cosmedics offer a professional range of skin peels that we offer in-clinic to maintain your skin's vitality. Free of mineral oils, parabens, harsh preservatives and artificial fragrances. Best sellers include Gentle Anti-oxidant Cleanser, Immortal Cream, B serum, Potent Retinol Serum and Mineral Pro SPF. 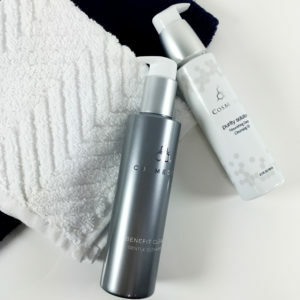 Cosmedix is a leading American brand that works in unison with the skin to strengthen, repair and restore. Backed by years of research and the latest advancements, Cosmedix products can cater to all skin types and conditions. As a full range they incorporate cleansers, exfoliants, treatment serums, masks, moisturisers and sunscreen. Work towards a healthier, brighter, more youthful skin with Cosmedix products. Best sellers include Purity Clean, Pure C and Clarity Serum. Aspect Dr can only be purchased through professional medical clinics, and is not available online or in department stores. 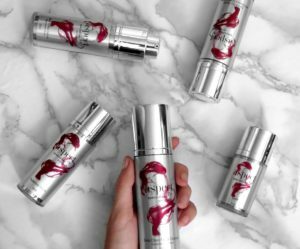 Offering a complete range of products with high quality ingredients, Aspect Dr helps many people realise their skin goals. These products treat all skin types and skin conditions, and greatly maximise the outcomes of professional services. Repair compromised skin, manage acne and maintain healthy, glowing skin. Free of mineral oils, parabens, harsh preservatives, artificial fragrances and propylene glycol. Best sellers include Resveratrol Moisturiser, Eyelift and Envirostat SPF. ASAP is an Australian made and owned brand. We stock their Moisturising SPF 50. A fabulous 2-in-1 product that restores hydration and protects you from the harmful effects of UV ageing. Fantastic for men and women. A convenient product for people who want a minimalist regime that gives maximum protection. Skin Medica's Lytera is a brightening product. We recommend Lytera to patients with pigment disorders like melasma or hyperpigmentation. Lytera is the type of product that we would recommend certain people use in the lead up to peels or laser for pigmentation. This non-prescription product helps you work towards a brighter skin. We only recommend the best mineral makeup to our clients. Millions of people wear makeup nearly every day of their lives, so it can have a huge impact on our skin. 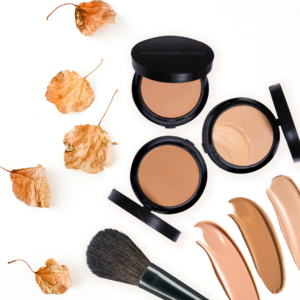 Mineral makeup is the best makeup to use because it actually contains ingredients that promote healing, have a natural SPF and don't clog your pores. We love and recommend Young Blood mineral makeup for its skin benefits and long lasting coverage. Young Blood contains no mineral oil, talc or lead and is non-comodogenic. Long lasting, with a colour palette to match skin tones of women all around the world. Young Blood offer a full range of fabulous foundations, mineral powders, finishing powders and more. Available in-store, we colour match you to ensure you get the right product. We have the advantage of being able to acquire specialty prescription and non-prescription creams, compounded from a pharmacist. These products fill vital gaps that may not be available within our other ranges. Modified Kligman's Formula is a script-only product. It is ideal for melasma patients and other people suffereing with pigmentary disorders. The active ingredients include vitamin A, a range of pigment inhibitors and hydroquinone. Hydroquinone is a powerful ingredient that has a bleaching effect on pigmentation, at the same time inhibiting the production of new pigment. Modified Kligman's can give great success to patients with many types of pigmentation- sun damage, age spots, freckles, melasma and hyperpigmentation. An initial consultation is required to decide if this product is right for you. Maximise your laser treatments, and work towards a clearer, brighter complexion. Estrogen creams are gaining popularity in the health and beauty field due to the positive effects they offer post-menopausal women. Research shows that after menopause women suffer faster collagen breakdown which leads to ageing, thinning skin, sagging, lines and wrinkles. Fortunately, advanced formulations of skincare creams containing estrogen-type ingredients can counteract these damaging effects. Studies show that long term use of these creams increase skin thickness and slows down ageing. A must for all post-menopausal women. These creams maximise the anti-ageing benefits of your skin needling or laser rejuvenation treatments.